Evolution of white blood cell (WBC) counts in both study groups during follow-up. Values are shown as mean and standard deviation. 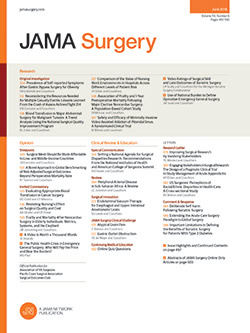 Hypothesis The addition of molgramostim (recombinant human granulocyte-macrophage colony-stimulating factor) to antibiotic therapy for nontraumatic and generalized abdominal sepsis is effective and has a significant impact on length of hospitalization, direct medical costs, and mortality. Design Randomized, double-blind, placebo-controlled clinical trial. Patients Fifty-eight patients with abdominal sepsis. Interventions Patients were allocated to receive, in addition to ceftriaxone sodium, amikacin sulfate, and metronidazole, molgramostim in a daily dosage of 3 μg/kg for 4 days (group 1) or placebo (group 2). Antibiotics were administered for at least 5 days and discontinued after clinical improvement had occurred and white blood cell count had been normal for 48 hours. Main Outcome Measures Time to improvement, duration of antibiotic therapy, hospital stay, complications, mortality, and adverse reactions to drugs. Results Median time to improvement was 2 days in group 1 and 4 days in group 2 (P<.005). Median length of hospitalization was 9 and 13 days, respectively (P<.001), and median duration of antibiotic therapy was 9 and 13 days, respectively (P<.001). Numbers of infectious complications in the 2 groups were, respectively, 6 and 16 (P = .02); of residual abscesses, 3 and 5; and of deaths, 2 and 2. Costs per patient were $12 333 and $16 081 (US dollars), respectively. Conclusion Addition of molgramostim to antibiotic therapy reduces the rate of infectious complications, the length of hospitalization, and costs in patients with nontraumatic abdominal sepsis. Recombinant human granulocyte-macrophage colony-stimulating factor (GM-CSF) is a specific hematopoietic growth factor extensively used for the treatment of neutropenia in patients with cancer after chemotherapy.1,2 In vitro, GM-CSF stimulates the proliferation and differentiation of hematopoietic precursor cells, as well as several functional activities of mature granulocytes.1-8 In vivo, it increases circulating white blood cells. Adult patients with generalized peritonitis were included in this randomized, double-blind, placebo-controlled trial. All underwent surgery and were given intravenous antibiotics. During surgery, they were randomly allocated to receive either molgramostim, 3 μg/kg per day for 4 days (group 1), or an identical-appearing placebo (group 2). Clinical and laboratory measurements were carried out without knowledge of the group to which the patient was allocated. The protocol was reviewed and approved by the institutional review board, and all patients gave written informed consent. Patients aged 18 to 80 years, with generalized peritonitis characterized by septic involvement of 2 or more abdominal quadrants at the time of surgical intervention and with positive peritoneal cultures, were included. Exclusion criteria were terminal renal, hepatic, or lung failure15,16; positive pregnancy test; current treatment with an immunosuppressive drug17; tuberculosis; or leukemia. Standard intravenous antibiotic therapy consisting of ceftriaxone sodium (1 g twice daily), amikacin sulfate (15 mg/kg per day), and metronidazole (500 mg 3 times daily) was started at the time of diagnosis. In patients allergic to β-lactams, ofloxacin (400 mg twice daily) was administered together with metronidazole. According to the random allocation schedule, molgramostim (3 μg/kg per day) or an identical-appearing placebo was administered subcutaneously during 4 days beginning in the operating room at the time of randomization. Antibiotic treatment was suspended after a minimum of 5 days of administration, when clinical improvement, normal temperature for at least 2 days, and normal white blood cell (WBC) count were observed. Antibiotic treatment was modified according to the antimicrobial susceptibility of the microorganisms isolated. Continuous variables were summarized in terms of mean ± SD or median (interval). Nominal and discrete variables were summarized as absolute and relative frequencies. Analysis was performed on an intention-to-treat basis. The 2-tailed t test for independent samples was used to compare means, and the Mann-Whitney test was used to compare medians. The Fisher test was used to compare nominal and discrete variables. P < .05 was considered statistically significant. Sixty-one patients were included in the trial during a 19-month recruitment period. Two patients from group 1 and 1 from group 2 were excluded because they refused therapy after randomization. Baseline demographic characteristics, Acute Physiology and Chronic Health Evaluation II score, results of laboratory tests, and intraoperative diagnosis were statistically comparable in both groups (Table 1). Microorganisms isolated from the peritoneal fluid of patients in groups 1 and 2 were as follows: Escherichia coli (16 and 17 patients, respectively), Enterococcus species (12 and 9 patients), Streptococcus species (2 and 5 patients), Klebsiella species (4 and 1 patient), Pseudomonas species (0 and 3 patients), Enterobacter species (0 and 2 patients), Staphylococcus (2 and 0 patients), Clostridium species (1 and 0 patients), Bacteroides species (0 and 1 patient), polymicrobial (9 and 10 patients), and Candida species (1 and 1 patients). After 24 hours of treatment, WBC count showed a gradual increase in group 1. On day 2, mean WBC count was 17.8 × 103/μL in group 1 and 12.2 × 103/μL in group 2 (P<.001). On day 4, mean values were 20.1 × 103/μL and 10.0 × 103/μL, respectively (P<.001). The WBC values returned to normal in both groups at the second week after randomization and remained so up to 8 weeks of follow-up (Figure). Median time to clinical recovery and improvement was 2 days in group 1 and 4 days in group 2 (P<.005). Median hospital stay was 9 and 13 days (P<.001), and median time with antibiotic therapy was 9 and 13 days (P<.001), respectively (Table 2). Because of 2 early deaths in group 1, the minimum hospital stay and duration of antibiotic therapy were 1 day. Six episodes of infectious complications developed in group 1 and 16 in group 2 (P = .02). Three patients from group 1 had residual abscess (presence of a collection of fluid detected by ultrasound or computed tomographic scan with a positive culture); 2 required reoperation and 1 underwent percutaneous drainage. In group 2, 5 patients had residual abscess; 4 required reoperation and 1 underwent percutaneous drainage. Wound infections were less common in group 1 (3 vs 9 cases), as was pneumonia (0 vs 2 cases). Five adverse reactions were observed in group 1, 3 possibly related to molgramostim administration (1 case of thrombocytopenia, 1 of generalized rash, and 1 of nausea) and 2 apparently not related (1 case of deep vein thrombosis and 1 of superficial phlebitis). In group 2, 7 adverse reactions were observed, specifically 1 case of liver and lung failure, 2 cases of pneumonia, 1 eventration, 1 allergy to β-lactams, 1 pulmonary embolism, and 1 episode of encephalopathy. There were 2 deaths in group 1 and 2 in group 2. Deaths in group 1 occurred early (within 12 hours after surgery) and were due to sepsis and pulmonary embolism. Deaths in group 2 occurred 5 and 7 days after intervention and were due to multiple organ failure and sepsis. Direct medical costs (in US dollars) in group 1 were $9963 for hospitalization, $1170 for antibiotics, and $1200 for molgramostim, giving a total of $12 333 per patient. In group 2, costs were $14 391 for hospitalization and $1690 for antibiotics, totaling $16 081 per patient. This resulted in a savings of $3748 per patient treated with molgramostim. In 1994, in a rat model of cecal ligation and puncture treated with 20 μg of recombinant murine GM-CSF, Toda et al24 failed to show improvement in 48-hour survival but observed some inhibition of early leukocyte sequestration in the peritoneal cavity. Later, Gennari et al13 found a 75% survival rate in a mouse model of cecal ligation and puncture plus transfusion and burn treated with recombinant murine GM-CSF, 100 ng/d for 6 days. This survival was significantly superior to the 30% observed in the placebo-treated animals (P<.001) and was attributed to improvement in gut barrier function and better ability to kill bacteria. Austin et al3 conducted a trial in a mouse model of trauma, administering GM-CSF or isotonic sodium chloride solution intraperitoneally for 5 days before performance of cecal ligation and puncture. The group receiving GM-CSF had a better survival rate (40% vs 5%; P<.05), as well as better macrophage function, less nitric oxide, and reduced bacterial growth indexes. Clinical trials with GM-CSF have been conducted in neutropenic and pediatric patients with sepsis. Bilgin et al25 compared a 7-day administration of GM-CSF, 5 μg/kg per day, vs placebo in a randomized trial of 60 neonates with neutropenia and clinical signs of sepsis. Good tolerance of GM-CSF, no adverse reactions, a statistically significant increase in neutrophil count on day 7, and improved survival (10% vs 30%) were observed, suggesting that GM-CSF is effective in neonatal sepsis with neutropenia. The microorganisms isolated in our patients were common pathogens involved in abdominal sepsis. The low isolation rate of anaerobes, however, deserves further comment. In our environment there is frequently a difficulty in the handling of abdominal cultures in that samples remain stored in adverse conditions for long periods of time, affecting the rate of isolation of anaerobes. Adverse reactions during molgramostim administration were observed in 3 patients. One patient developed a rash that disappeared once molgramostim treatment was suspended, 1 developed thrombocytopenia, and 1 had nausea. This low incidence of adverse reactions agrees with the study by Dierdorf et al,27 who observed 68 patients with neutropenic pneumonia of fungal or bacterial origin treated with GM-CSF, 5 μg/kg per day for 13 days. Adverse events were rash (1 patient), fever or chills (2 patients), malaise (1 patient), myalgia (2 patients), and increased myeloblast count (1 patient). Good tolerability was observed in 89%, and no aggravation of pulmonary inflammation or sepsis occurred. With regard to costs, addition of molgramostim to standard antibiotic therapy resulted in substantial savings (23%) in direct medical costs. The savings are mainly produced by the significant reduction in length of hospital stay and time with antibiotic therapy. In conclusion, our data support the addition of molgramostim to standard antibiotic treatment of patients with abdominal sepsis of nontraumatic origin. Because of its efficacy and safety, adjuvant therapy with molgramostim may be of great benefit for this group of severely ill patients, by reducing the number of infectious complications, accelerating clinical improvement, and shortening the duration of antibiotic therapy. Additional benefits of molgramostim are shorter hospital stay and lower direct medical costs. Further studies to confirm these results would be desirable. Correspondence: José Sifuentes-Osornio, MD, Department of Infectious Diseases, Instituto Nacional de Ciencias Medicas y Nutricion Salvador Zubiran, Vasco de Quiroga 15, México City, 14000, México (JSO@quetzal.innsz.mx). Accepted for Publication: March 14, 2005. Funding/Support: This study was supported in part by a grant from Schering-Plough de México, SA de CV, México DF, México.